Unitrans Worldwide, Inc. provides a modern, 25,000 square foot facility just 20 minutes on the south shore of Boston. We are strategically located at the crossroads of Routes 93, 95, 24 and 3. 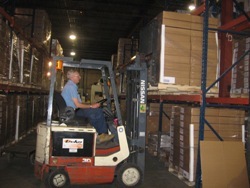 Unitrans can provide warehousing and distribution sourcing at our facility. We can also obtain warehousing for you through our network of 3PL agents anywhere in the US or overseas. Long and short term storage is available for any duration. Unitrans Worldwide can handle any size product with open floor space or stacked, skidded product. We also provide customers with daily, weekly, or monthly inventory reports of its product activity. Rotation of product is done to your specifications (FIFO,LIFO) to ensure a customized approach. Unitrans Worldwide will unload your ocean container or truckload and palletize your product to meet your specifications. We will cross check your packing list count and inspect the packaging for any disclaimers or damage. Run out of room or missed a delivery deadline? Unitrans will off load your product same day and reschedule the delivery when you determine. Many other freight companies rely on us to handle refused loads or missed appointment deliveries. Shipping efficiencies through established accounts with all major carriers both domestic and international. Fully flexible to provide customer-defined procedures for pick and pack, kitting, light assembly and shipping. We provide professional packaging and crating services Nationwide for any product for safe transport across town or across the world. Unitrans Worldwide can also provide export-compliant pallets. Leave your trade show schedules to us! We can coordinate your show schedules and store all your exhibit materials. By outsourcing your tradeshow booth storage, your business saves office space and reduces liability. We can coordinate, up to a year in advance, all your transportation needs both to and from each show, so that you can focus on other aspects of your business. We are proven professionals when supervising trade show management and are experts in with navigating convention hall services around the country. We also offer up-to-date tracking of your trade show materials. Whether your booth is a few cases, some skids, or an entire exclusive truck load; the experienced staff at Unitrans will ensure your materials will arrive at your destination by your deadline.